After many, many leaks, Motorola has finally unveiled its latest flagship phone at a joint event with Verizon in New York City. The Gingerbread-powered device revives a classic Motorola nomenclature: they’re calling it the DROID RAZR after the drool-inducing flip phone of years past. The skinny 4.3-inch slate will be Motorola’s new flagship phone after the somewhat underwhelming BIONIC, and one of the most high-profile phones to use Verizon’s 4G LTE network. Chief among the new features is an armored Kevlar construction, a first in a mainstream phone. The 4.3-inch qHD screen is the first to also be Super AMOLED and qHD – a step above the standard LCD panels. The screen size isn’t the only thing the DROID RAZR shares with the X2 and Bionic – from the no-frills tablet style to the hump on the back holding the 8-megapixel 1080p camera, you could be forgiven for thinking that the entire device was at some point known as the DROID X3. While the main section of the phone gets as slim as 7.1mm, the hump will be a bit more. The phone’s construction is fairly novel. In addition to the armored back panel, the entire case is covered in a splash-proof casing and the stainless steel frame extends out into the exterior styling. Also included are aluminum and glass accents and parts of the phone are protected bu ultralight Kevlar, making the phone only 117 grams. Note the tapered corners, not unlike the Motorola Photon and leaked photos of the next-generation XOOM – these seem to be hallmarks of Moto’s industrial design going forward. Standard Micro USB and HDMI ports adorn the left side, and there’s a 1.3 megapixel front-facing camera for all the video conferencing apps on the Android Market. Underneath the hood you get some now standard superphone guts: a 1.2GHz dual-core processor with a full gigabyte of RAM, 16GB of internal storage and an extra 16 on the included MicroSD card. All this muscle is put to use on Android Gingerbread, though Motorola and Verizon are both promising an upgrade to 4.0 Ice Cream Sandwich, which you might be hearing about later today. The large 1800 mAh battery should see you through a full day of standard use, according to Motorola. They’re claiming 12 hours of 3G browsing and 8.9 hours of talk time, getting help from the included battery manager app, which will be user-customizable. Verizon and Motorola are claiming a 42 Mbps maximum download speed from the RAZR’s LTE radio – in fact, the DROID RAZR will be the first smartphone to stream Netflix in HD. Motorola is including some extensive cloud and syncing options, allowing you to access and download files from your desktop computer with MotoCast. Citrix collaboration software and compatibility with the Lapdock 100 dock and the new, more powerful Lapdock 500 will make it enterprise friendly. Other accessories will include desktop and car docks, plus a Bluetooth headset and two different keyboards. Pre-orders will start on October 27th for $299. The phone itself will be available sometime in November. 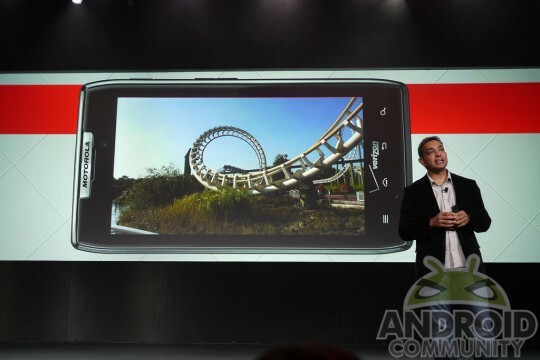 The phone will be called the Motorola RAZR in other markets, where it will also be available in November.